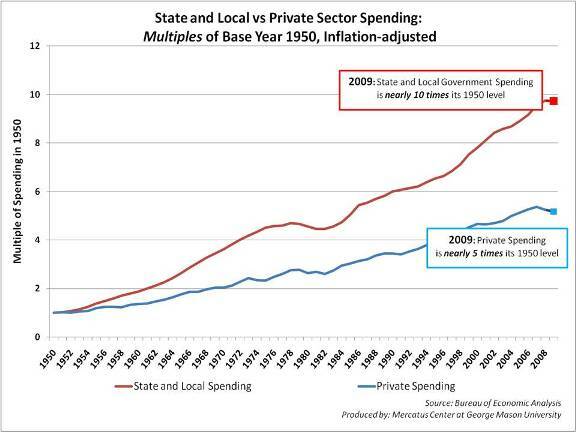 State and local government spending has grown at a remarkable clip over the last half-century. Since the close of World War II, aggregate state and local spending grew 34 percent faster than the private sector and 37 percent faster than federal government spending. 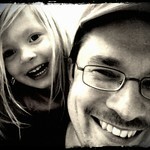 In recent years, the difference in growth rates has widened. From 2000 to 2009, state and local government spending grew nearly twice as fast as the private sector (while over the same period, the federal government grew even faster). Spending growth has not been uniform across spending categories, and Medicaid spending is by far the fastest-growing component of state expenditures. One of the dirty secrets fueling the growth in state spending is the relationship between the states and the Federal Government. Every state (except Vermont) has a balanced budget requirement. The Federal Government does not. Nearly a third of Missouri's budget is funded by the Federal Government. I suspect that the Federal Government, unconstrained by a balanced budget requirement, is abetting the growth of state and, probably, local governments.